By now, we’ve all heard about the arguments regarding the choice of using plastic predominantly for a phone’s frame – it’s sometimes thought of as brittle in comparison to other things. Even though LG decided to continue using the material with its latest flagship, the G3, they’ve actually added a thin film of metal to give it that luster. Now, for those of you planning to pick up the prized phone, the Spigen Slim Armor case is intent on providing that all-around protection to keep the phone in pretty condition. 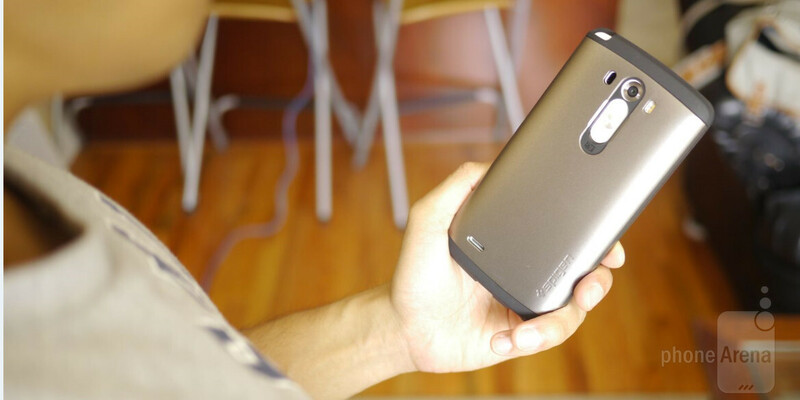 Yet again, the Spigen Slim Armor case for the LG G3 follows in form to the other cases in the series – so there’s nothing particularly new with the overall design. In fact, it’s still comprised out of two particular components. The first is an inner rubbery TPU case that gets fitted around the back and sides of the LG G3, where it’s meant to offer shock protection in the event it’s dropped. Secondly, the entire thing is held together by a hard polycarbonate frame that covers the majority of the back of the phone. Our particular unit, the champagne gold version, has a pleasant contrast look with the black inner TPU case. Not surprisingly, the combination here enables it to solidly protect the phone from all sorts of drops. From small ones, to even lengthy ones that would make some people wince in anticipation of its fall, the Spigen Slim Armor offers great protection. At the same time, it doesn’t pack on as much bulk like some of those rugged cases. However, our one complaint is that the rear buttons are made more difficult to feel out, since they’re now really recessed due to the added layers. Personalization is also intact with this case, as it’s available in seven colors that are sure to appease a wide audience. In addition, its $24.99 price is also pretty manageable, so it won’t totally break the bank. With a solid level of protection, combined with a colorful selection, the Spigen Slim Armor case is definitely something you’ll want to keep in mind when picking up the phone.